June 12, 2017 1:09 P.M.
Ontario is stepping up its fight against the national opioid crisis with new front-line addiction and mental health workers for every community in the province and the distribution of almost 80,000 additional naloxone kits per year to front-line organizations. 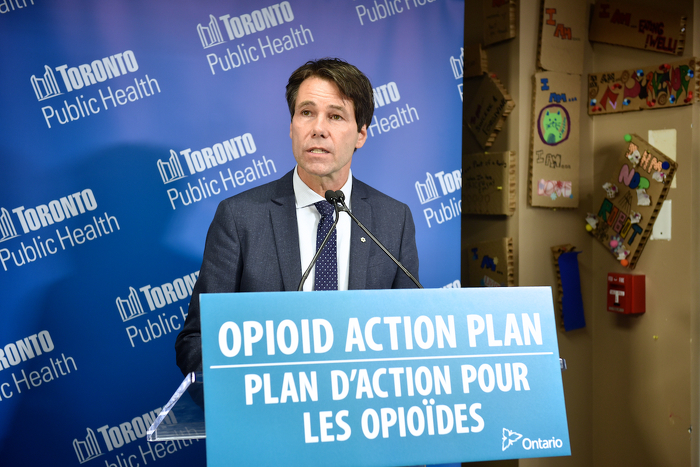 Dr. Eric Hoskins, Minister of Health and Long-Term Care, was joined by John Tory, Mayor of Toronto at The Works Needle Exchange Program in Toronto today to announce new measures to tackle Ontario's opioid crisis. The province is providing funding for every board of health in Ontario to hire more front-line workers, such as addiction outreach workers and nurses, to help municipalities expand supports for people impacted by opioid addiction and overdose. This will allow communities to improve addiction outreach, education and planning while working on early warning and surveillance of opioid overdoses. More than 6,500 additional naloxone kits per month will be distributed in the community to those at risk of opioid overdose and their friends and family, through community organizations such as shelters, outreach organizations, AIDS Service Organizations, Community Health Centres and withdrawal management programs. This will broaden the reach of existing harm reduction programs that are currently offered by Public Health Units and community partners. Later today, Dr. Eric Hoskins, Minister of Health and Long-Term Care, Marie-France Lalonde, Minister of Community Safety and Correctional Services, John Fraser, Parliamentary Assistant to the Minister of Health and Long-Term Care and Sophie Kiwala, Parliamentary Assistant to the Minister of Children and Youth Services will be meeting with mayors from across the province to discuss the unique experiences of individual communities dealing with opioid addiction and overdose and to continue working together to address this important issue. Ontario is expanding the distribution of naloxone to the places where people who use drugs are living or currently accessing services. Local public health units will serve as naloxone distribution hubs for eligible community organizations. Ontario’s first comprehensive Strategy to Prevent Opioid Addiction and Overdose includes initiatives to enhance data collection, modernize prescribing and dispensing practices and connect patients with high quality addiction treatment services. Recently announced initiatives include: a new Interactive Opioid Tool that provides a wide range of data on opioid-related morbidity and mortality across the province; stricter controls on the prescribing and dispensing of opioids, including fentanyl patches and expanding access to opioid substitution therapy; and funding for three supervised injection services sites in Toronto, and committing to provide funding for an additional site in Ottawa. As of March 2017, more than 28,000 naloxone kits have been dispensed free of charge at pharmacies, public health units and community-based organizations that run needle exchange and hepatitis C programs, as well as provincial correctional facilities. Minister Hoskins speaking at a podium.